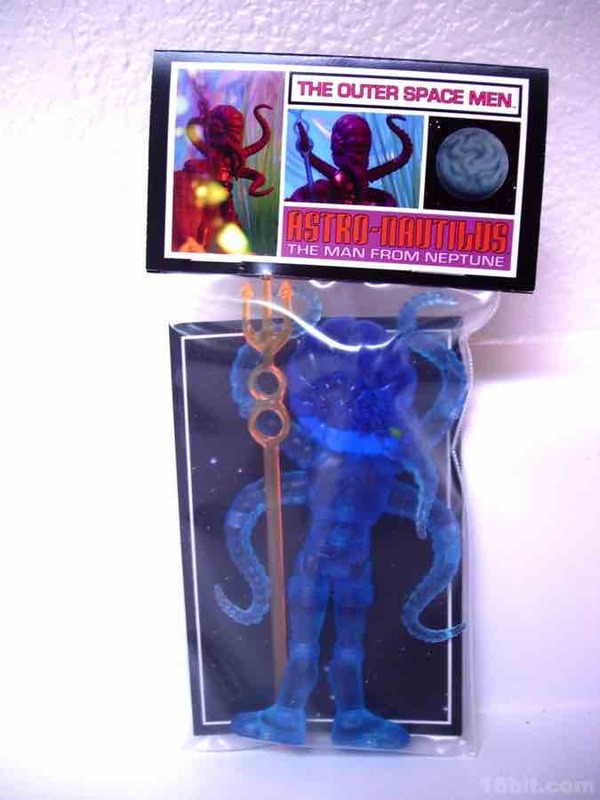 While the first version of the figure in purple was great, the Beta Phase blue version of Astro-Nautilus, The Man from Neptune is freaking gorgeous. 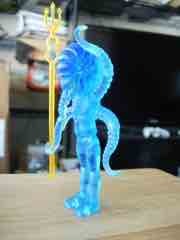 While it's hard to photograph just how the light illuminates his large, clear head, its really quite stunning. The pictures you see here are raw, unedited photos (although I admit I did lighten up the bagged photo below). The rest were taken in my living room with the window open. The figure is a redeco of the now oft-used Astro-Nautilus mold, articulated in several places, and each point of articulation is also a place where you can pop off an arm or a leg to swap pieces. 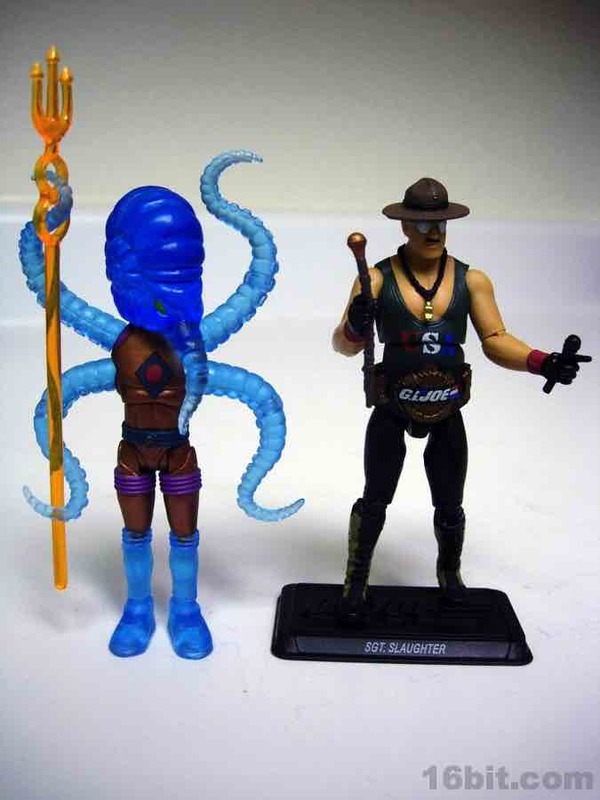 The figure is jointed in two places on each tentacle, plus includes scores of other moving parts-- you can really mix and match and make all sorts of goodies using this 3 3/4-inch figure (and any Glyos-related figure) body parts. 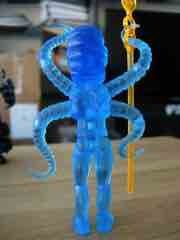 The clear blue plastic is really electric, plus the figure's unique design has more in common with vintage 1980s action figures in that it can do things like sit. Remember that? Figures used to be able to sit. I know, it paints me as old. The sculpt by the Four Horsemen is both simple and detailed-- they don't overdo it, which is ideal given they're updating bendable figures from the 1960s. The smooth lines of the suit are retained, the suction cups under his arms (and nose) are all here, plus there's just enough detail to make it seem like more than just another old space toy. The detail on the chest is pretty good, if simple. 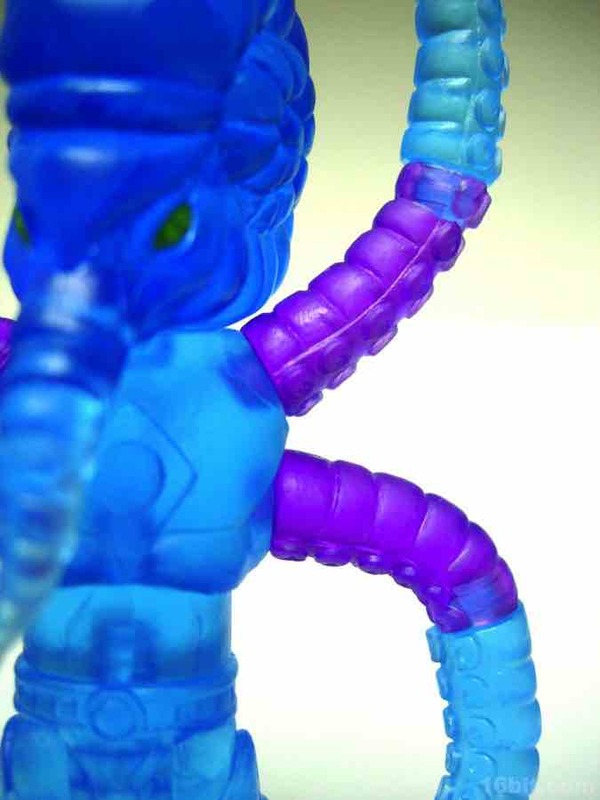 Each limb has at least 2 joints, and you can actually connect some of the tentacle arms together to make an even longer arm, assuming you're in to such things. It's a nice bonus detail that rewards buying more figures, plus the Horsemen put a connection point in the bottom of the boots so you can plug a head on there if you want, or possibly develop a stand and use it as a foot peg hole or something. Heck, you know what these would be good with? Fisher-Price's Adventure People space line. (Awesome.) 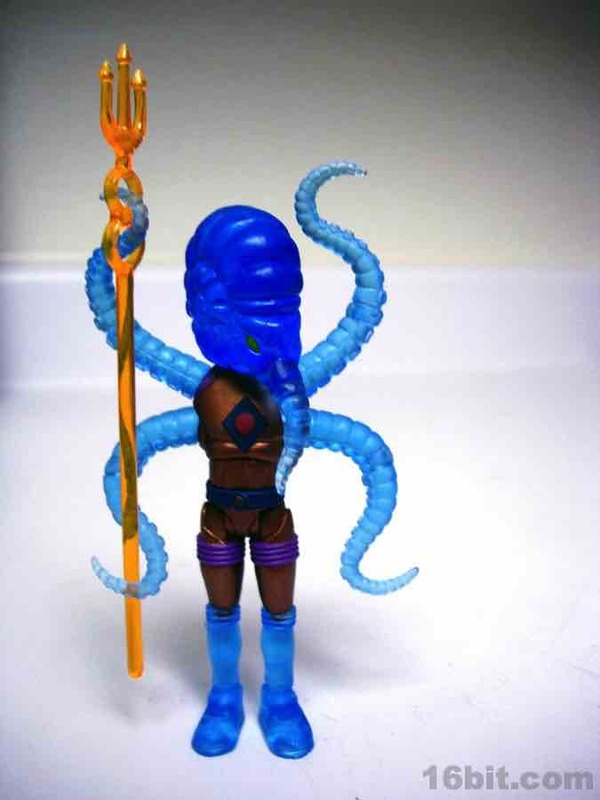 Fans of the line will recognize a fair amount of parts reuse with this blue alien-- on this figure, the legs are basically the same as the other figures released so far, although the torso, arms, and head are unique to Astro-Nautilus. 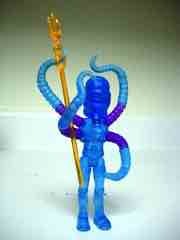 So far, anyway, maybe some day the Horsemen will repaint it and add a bow calling it Ms. Astro-Nautilus. While the clear figures do seem "cheap," they really do look amazing in person and are the sort of thing that playing with may make you want to buy more of them-- they're just really an enjoyable series of toys. Considering that the figures in the Beta Wave now go for less than their issue price, it's probably worth your while to track them down now if you're curious how they worked out. It's a delightfully retro line. 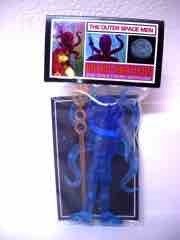 One final note-- this is the real final note-- below, you can see some pictures of the Beta Phase blue figure combined with parts of the Alpha Wave purple figure. 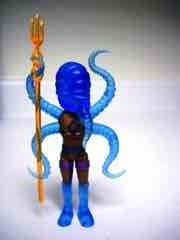 Because you know, you need extra tentacles.